Somax Performance Institute is donating technology it has developed to improve athletic performance to help wounded veterans who have returned from Afghanistan and Iraq. They have fought to defend our freedom and that of the people of Afghanistan and Iraq. In our small way, we hope to help free them of some of the ravages of war. Microfibers, a mild form of scar tissue, develop in the connective tissues between the muscles as a result of stress. Somax releases these microfibers with Microfiber Reduction. 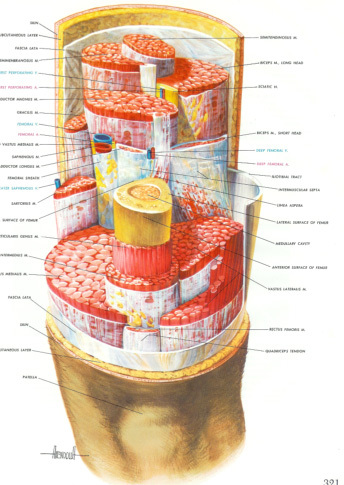 Normally, the connective tissue membranes (white) between the muscles (red) are smooth. They allow the muscles to slide past each other, which they have to do in order to stretch. But when you have even a mild injury (falls on court), overuse (lifting weights, running) or stress , microfibers form as part of the healing process to immobilize the area. Microfibers are nature’s internal cast. Unfortunately, once the area has healed, the microfibers not only do not go away, they tend to accumulate over time, making athletes stiffer with age. Since microfibers are a form of scar tissue, they cannot be released by stretching. Individuals who have developed microfibers find that stretching does not improve their flexibility. Microfibers can be released with Microfiber Reduction, a special program of connective tissue massage developed by Somax to help athletes improve their flexibility far beyond what stretching alone can do. Once the microfibers and tension are released, the improvement in flexibility can be maintained by simple stretching. A number of the athletes Somax has worked with over the past 38 years suffered horrific injuries before we saw them. One was a NASA pilot who was in a coma for several weeks following a helicopter crash in which his co-pilot died. He suffered massive head injuries, as well as injuries throughout his body. He was told he would never walk again. For nine years he struggled to rehabilitate himself, never giving up hope that he would return to running and playing golf. When we first saw him, he could barely walk. Within a few weeks he was running and returned to beat his old boss at NASA in a round of golf. Another athlete, a rock climber, also suffered massive head injuries during a fall while climbing. He was left suspended upside down for 6 hours until help arrived. He was in a coma for several weeks and was also told he would never walk again. Fortunately, his mother found people who could help her son, including Somax. Since working with Somax, he has completed graduate school and is able to walk and lead park tours. We helped both of these athletes regain their ability to move by releasing microfibers that had formed between their muscles as a result of their injuries. While both sustained massive head injuries, it was actually the microfibers in the connective tissue between their muscles that were holding them back. By releasing their microfibers, they were able to move again. Here are some examples of the improvement in flexibility with Microfiber Reduction. Some veterans of Afghanistan and Iraq have suffered injuries from IED’s, truck bombs, RPG’s, mortars and suicide bombers. Many of these soldiers have received excellent care, but still find that they have been unable to improve to the level they want. These are the soldiers who will benefit from our Microfiber Reduction program. During 2012, we will donate a week (30 hours) to help one soldier from Afghanistan and a week to one from Iraq to regain their freedom of movement by releasing microfibers that have formed as a result of their injuries in the theater of war. Competition can be very stressful. Somax has helped swimmers, golfers, tennis and soccer players improve their performance by reducing the stress of competition with our Stress Reduction program. The program is based on reducing stress by tapping on a sequence of acupuncture points. War can also be very stressful, particularly in asymmetric warfare where the enemy hides among civilians, hoping to draw fire and create civilian casualties. Soldiers in Afghanistan and Iraq have had to both fight the enemy and at the same time be careful not to injure civilians. This, by itself, creates a very stressful situation. As we know from working with elite athletes, stress does not leave with the passage of time. Past defeats and difficulties stay with the best of athletes despite their attempts to ‘put them behind them’. Stress Reduction, however, is able to help them reduce the stress of these difficulties, enabling them to perform better in the present. Some of the soldiers returning from asymmetric warfare bring home the stress of war with them. Stress Reduction will help to reduce that stress. Somax with donate a total of 5 Stress Reduction sessions to Afghanistan and Iraq veterans who find that they continue to suffer the effects of the stress after their tour(s) of duty. The Stress Reduction sessions are two hours and can be conducted over the phone. It is not necessary to discuss the details of the stress, only to tap on the correct sequence of acupuncture points. As a follow-up, a list of the points and a summary of the procedure will be sent to each veteran. Once they have learned the procedure, they can continue to work on their own. Veterans of Afghanistan and Iraq who would like to take part in this program are urged to write to Somax, describing their situation and what they would like to accomplish, along with proof of duty. Any records or supporting material are helpful. Somax will pick two applicants for Microfiber Reduction. Their program will be 30 hours over one week at Somax headquarters in Tiburon, CA. Applicants will responsible for travel and lodging, but all Somax services will be free. The 30 hours will also include Stress Reduction. Somax will also pick ten applicants for its Stress Reduction program. The two-hour program can be completed at our headquarters in Tiburon, or over the phone. Both are equally effective. Somax will choose those from the list of applicants which it feels it can best help and then notify them of their selection for this program. Individuals wishing to make donations to defray travel and lodging expenses for veterans participating in this program can contact Somax at the address above.